The deaths of two Jaffna university students, Vijayakumar Sulakshan and Nadaraja Kajan, allegedly in a Police shooting still remains a mystery for the people in Jaffna as Police and human rights groups are still in the process of conducting investigations into the students’ death to give a clear picture about the incident that triggered a sense of uneasiness among the Northern community for the first time after the end of war in 2009. Why Police shot at these two innocent students, when they were travelling in a motorbike in the night, and why the Police allegedly responsible for the incidents tried to hide the truth by posing this incident as an accident, are the glaring questi ons that need immediate answers for the people in the North as they demand justice for the two students’ deaths. Though public protests demanding justice for the two students’ deaths are just settling in the North following the hartal campaign staged on Tuesday, the fellow student community of the two university students from the Jaffna University are still continuing with their protest refraining from attending lectures, demanding speedy legal action against those responsible for the two deaths. However, the isolated incidents by some armed groups claiming the responsibility for the attacks on Police personnel in Chunnakam area reported after the two deaths of the students, has created a confusion in the Jaffna peninsula over investigations compelling the people in Jaffna to think that those incidents were aimed at diverting their attention from the investigations. As the investigation are going on, the Police keep stoic silence on the incident and refrain from commenting on the incident until they complete the investigations. Whatever the reason for the incident that had taken place in Chunnakam area on the Jaffna-Kankasanthurai Road on October 20 night, finally it was the family members of the two students who had suffered immensely due to the loss of lives of the two students seemingly the strength behind these two families who had brought them up amid greater difficulties. Just two days after the funeral on Monday, and the hartal staged in the North, the family members were performing religious rituals for their sons as we reached them on Wedensday and Thursday. Living in Bharathipuram, a village close to the Kilinochchi town Nadaraja Kajan was the fifth child among the seven children of Nadaraja Sarojini who had spent a life full of miseries after migrating to Kilinochchi in 1982 from the Balangoda area. The 61 year old Nadaraja Sarojini, the mother of Kajan was shocked to hear the death of her son who had been a tower of strength to her family. It was in the wee hours on Friday that they received a call that her son was hospitalised after an accident. It was after reaching the hospital that they came to know that her son had succumbed to his injuries. “They showed my son’s body stained with blood. He had sustained head injuries and his ribs were broken. But they did not say how he had died. The Police had informed one of his friends that they had found them in Chunnakam area after an accident”, she added. “My kolla was disabled from his young age and he was so innocent. I tried my best to get him cured and he was hopeful that he can one day get his legs cured. But today he is no more with us”, she added. A son very concerned about his family Kajan had his final contact with his family on Thursday night around 9 pm with his younger brother and had instructed him to stay at home in the night to look after their mother and sisters. According to his mother he had earned some money by doing mason work when he had free time and assisted his mother to run his fatherless family. “We don’t know where Kajan had gone that day as he stayed there in Jaffna during week days in the hostel. He had a close friendship with Sulakshan and sometimes stayed at his home. We came to know from his friends that they had attended a birthday party in the evening and had done some university work with his friends. We don’t know where they were going at the time they faced this incident”, she added. “We don’t know what exactly had happened but we have doubts about the death of our son and his friend because the Police tried to hide the truth about the incidents. It was on Friday afternoon that we came to know that the death of my son’s friend Sulakshan was due to gunshot injuries. We also suspect that they had taken the life of my son to hide the truth as he was the only witness to the incident”, she added. She vehemently denied allegations that her son was drunk at the time of the incident, she knew that he had no such habits. “I know that we cannot take back his life whatever we do, but we need justice for what happened. The senior Police officers promised us justice, and to assist in the funeral but the University students told us not to accept any assistance from the Police”, she added. “I need justice for my son. His death is a greater loss to me and my family because he is the only child who could enter the university from our family but I don’t need his death to be a reason for another backlash in the country because I don’t want to hear that my son was the reason for such a situation in the country again. We want immediate action to ensure that these types of incidents won’t happen again, in the future,” Sarojini, the mother of Kajan, added. S. Vijayakumar and V. Babinayagam, the parents of Sulakshan, also expressed similar sentiments over the death of their son, the second child of their family, earning a living from daily paid labour. Like Kajan, Sulakshan was also helping his ailing father run the family. On that particular day both Sulakshan and his friend Kajan had left their homes to meet a friend to copy some lecture notes when they had met with this unfortunate incident while returning home from Jaffna. The families came to know about the incident around 2 am on Friday morning from a friend. “We were informed that they had met with an accident and admitted to the hospital by the Police and it was only on Friday afternoon that we came to know from the Coroner that our son had died due to gunshot injuries. We came to know that he had sustained three gun shot injuries and had died due to injuries caused to his heart,” Vijayakumar, the 56 year old father of Sulakshan added. 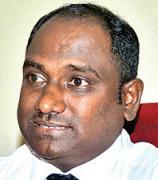 According to Vijayakumar, his son had injuries on his chest, abdomen, neck and thighs. “Now the Police is saying that they were compelled to shoot at them as they defied their orders to stop the motorbike. If they shot at them how did my son who was the rider of the motorbike got injured. If they shot at them from behind it should be Kajan who was sitting behind who should get injured first”, Vijayakumar added. “We saw an end to the violence in the country in 2009. The present government had done good things to the people. But if the Police are behaving like terrorrists and killing people like this, it is not good for the government too”, he added. Babinayakam, the 46 year old mother of Sulakshan queried as to what was the crime their son had committed to be shot like this. “Were they armed or carrying guns. If they did not stop the motorbike they could have easily followed them and stopped them without shooting them because they were riding only a CT 100 motorbike which can be easily followed by the Police”, she added. “If people can use the A- 9 road and S. Vijayakumar and V. Babinayakam can go to Jaffna at anytime in the day why could not my son ride his motorbike freely where he was born”, she queried. They questioned how Police can claim that they were asked to stop at a Police check point when there is no Police checkpoint anywhere near the place the incident had occurred. Tears rolled down her cheeks when she recalled how her son helped the schoolchildren to perform dramas. “He was very fond of dramas and won several awards as best actor but he is not a criminal to be shot and killed like this”, she added. T. Kanagaraja, Regional Co-ordinator, Human Rights Commission of Sri Lanka said as the Human Rights Commission in Jaffna they are monitoring the situation in Jaffna following the incident and they will be handing over our preliminary findings to the Human Rights Commission office in Colombo in the next few days and they will compile a report on this incident based on our report. So far the Human Rights Commission has not received any complain in this regard but according to the mandate given to us we can have our own investigations into such incidents. As the Human Rights Commission we have the mandate to conduct voluntarily investigations when there is Police inaction or Police influence on the investigation. “We are also observing whether there are any pressures on the immediate family members to suppress investigations. We are meeting the family members of the victims and other relevant parties when compiling our report to the Human Rights Commission”, Kanagaraja added. He also said that they are monitoring the situation about the armed gangs in the peninsula and are in contact with the Police regarding these armed gangs. Dr. A. Saravanabawan of the University of Jaffna Teachers Association along with its Secretary S. Sivakanthan and Treasurer Dr. N. Kengatharan said they strongly condemn the killing of two innocent students of the Jaffna Universit while riding a motorbike on October 20 midnight. “We strongly condemn this type of the of violent action. This was the worst shooting incident reported in the Jaffna district in the post war context. “We strongly believe this killing was planned because there was an attempt to hide this incident posing this as an accident and this is not good for the good governance government”, Dr. Saravanabawan added. S. Sivakanthan the Secretary of the Association urged that the Government should not take this incident as another incident and try to create a false picture about the incident using some media in the South. “We strongly condemn such attempts and urge the government to conduct a fair investigation without dragging it for months”, he added. Dr. Kengatharan, the Treasurer of the Association said they are planning to form a fund to assist the immediate family members of the victims and urged the government to assist the family members. 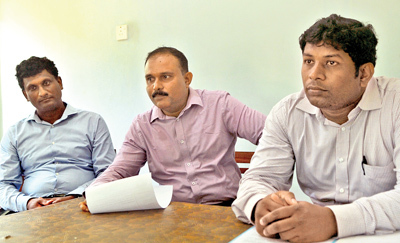 President of the Management and Commerce Students’ Union of the Jaffna University, speaking on behalf the student unions, said that they were boycotting the lectures demanding immediate action to conduct the investigation. “We need an assurance to have credible and unbiased investigation with proper legal representation on this murder case and also urge the National Police Commission to investigate the illegal and immoral act by the Police, who had tried to show this murder as an accident”, he added. The students’ Union also urged that the international and national human rights bodies and activists to get involved in supervising the investigation. “We also urge the investigation to be conducted without delay and file a case against the defendants in the High Court for traiwithin one month. We also urge the authorities to pay compensation to the immediate family members for the loss and additional economic benefits on a monthly basis”, he added.